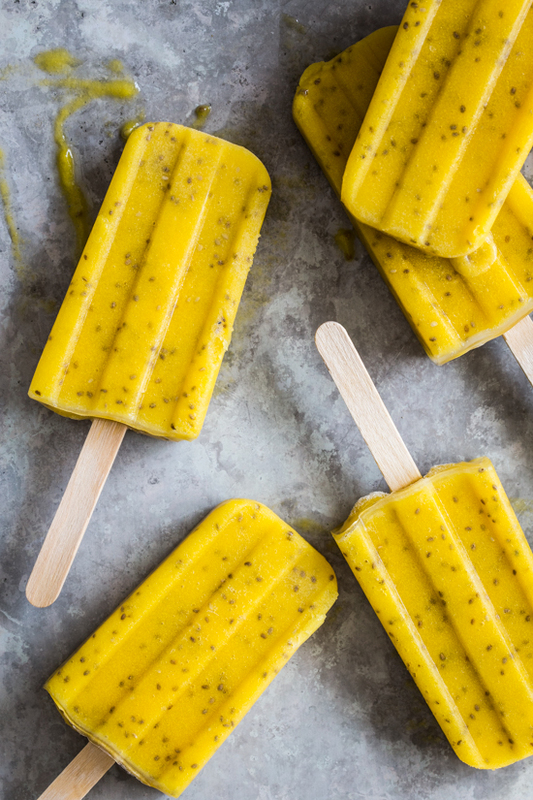 A sweet but healthy treat, these 3 ingredient Mango Chia Popsicles are full of pureed mango, coconut water and chia seeds. Ah, homemade popsicles. I’ve been bitten by the popsicle making bug and it’s quickly becoming one of my favorite treats to make. I mean, you can’t get much easier. Blend up some ingredients, pour in molds, freeze. The most difficult step in the entire process is having the patience to wait until the pops are good and frozen before you break into them. I have learned that from experience. No one wants a sloppy pop. That sounded so weird I had to keep it in there. Can I tell you how much I love that you can basically blend up fruit and throw it in a popsicle mold and call it a day? Yes, obviously you can get more intricate and creative than that. My Roasted Berry Goat Cheese Popsicles were more involved…although not by much. 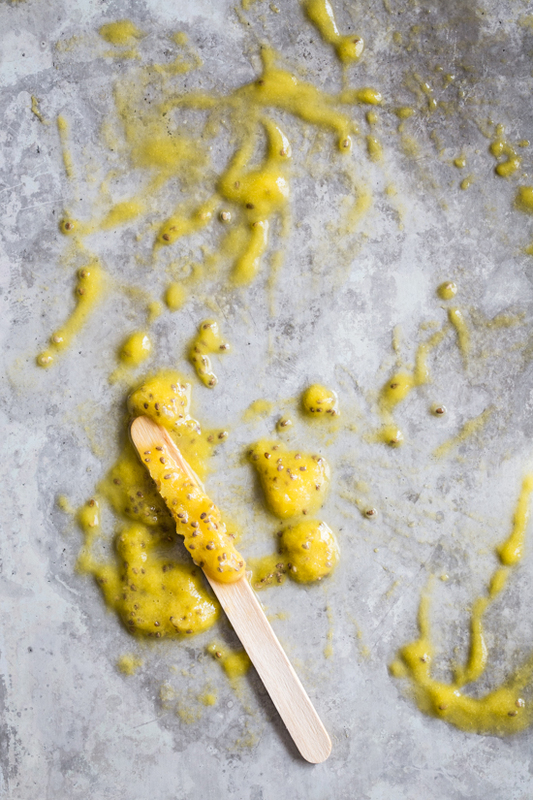 But honestly, blended mango with some coconut water and chia seeds is pretty much as great as it gets. The Baby asked me for a popsicle at 8:30 in the morning the other day and I was all, ‘SURE! Have a mango pop’. And then she was all, ‘yeeessss….‘ thinking she got away with something special. Which she did, really, because these mango chia popsicles are quite fantastic. Very fruity with a bit of texture from the chia seeds. These all fruit pops have me thinking what other popsicles I can make out of all fruit. Strawberry? Blueberry? We’ll have to wait and see where the popsicle train takes me. But for now, we’ve got mangos. And they are wonderful and fabulous and you will be a happier person for having made these and scarfed them down just as fast. Awesome fruit is truly my very favorite thing about summer. How could it not be? Place mango and coconut water into blender and blend until smooth. Stir in chia seeds. Pour mixture into 10 - 3 ounce popsicle molds and place a wooden stick into each (or follow the directions of your popsicle mold). Freeze until frozen, at least 6 hours. Enjoy! This is my favourite tropical popsicle EVER!!! Thank you so much, Pang! For some odd reason, I’ve talked myself into a no-added-sugar diet for a while. . . but I’m missing my sweets so much right now. This looks like it will do the trick perfectly! Can’t wait to try it! Such delicious photos! Yes! These would be perfect for that diet! I want to try some other fruits, too. I’m thinking anything that is naturally very sweet will work wonderfully 🙂 Thanks for stopping by, Allison! Those are gorgeous looking popsicles!!! What a fun flavor combo too! The color of the mango is crazy, isn’t it? I love me some mangos 🙂 Thanks for stopping by, Jocelyn! 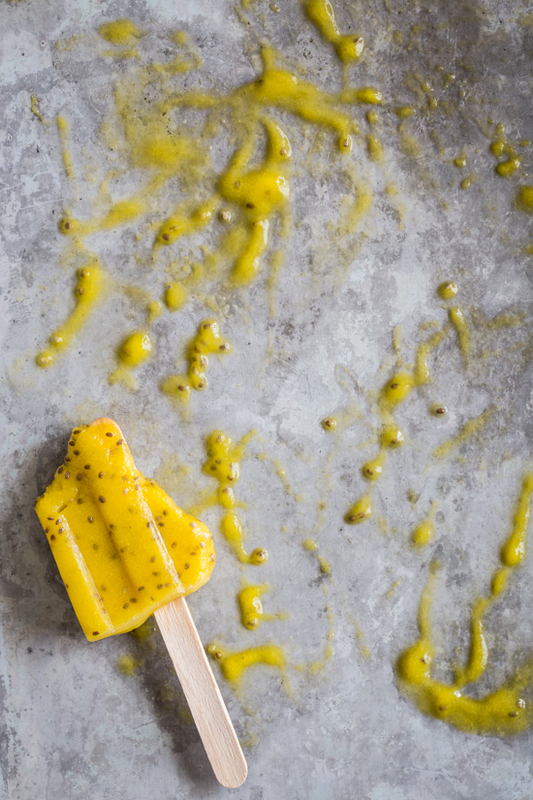 I LOVE the idea of adding chia into these pops – you’ve for sure inspired me. Thank you!! These sound delicious and so refreshing! 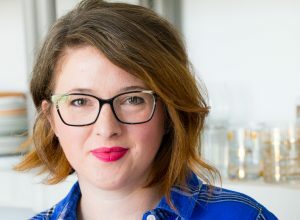 I am ALL over this recipe. Thank you! Anytime, Monique! Thanks for stopping by! This looks sooooooooo delicious!! 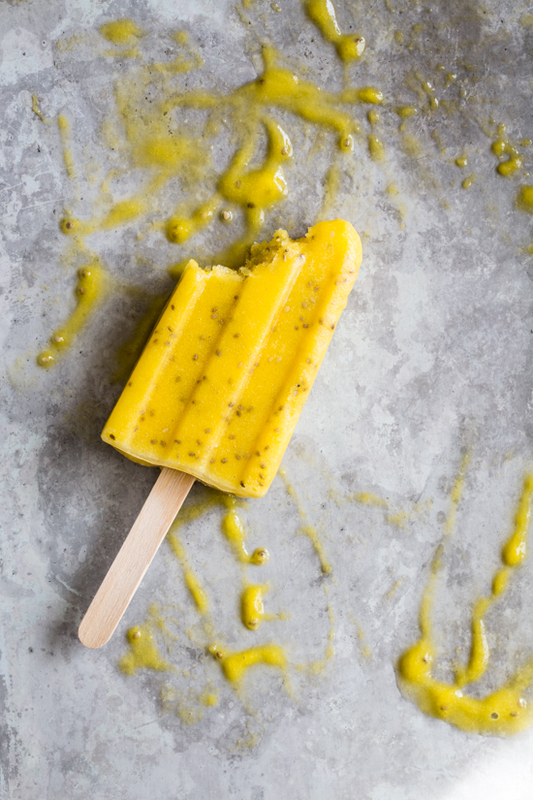 It’s so hot today and I am craving a popsicle – gonna have to try this recipe asap! Can I use canned mangos? I’ve never used canned mangos, but I don’t see why you couldn’t!